The weekly Guides Calendar allows you to effectively schedule and manage your guided trips and scheduled Guide Days off. As with other FishWare calendars, color coding indicates appropriate conditions such as All Day Trip, Morning Trip, Afternoon Trip, Evening Trip, mixed reservation (Yellow, this indicates that something may be wrong with the reservation or optionally you can specify a mixed trip). 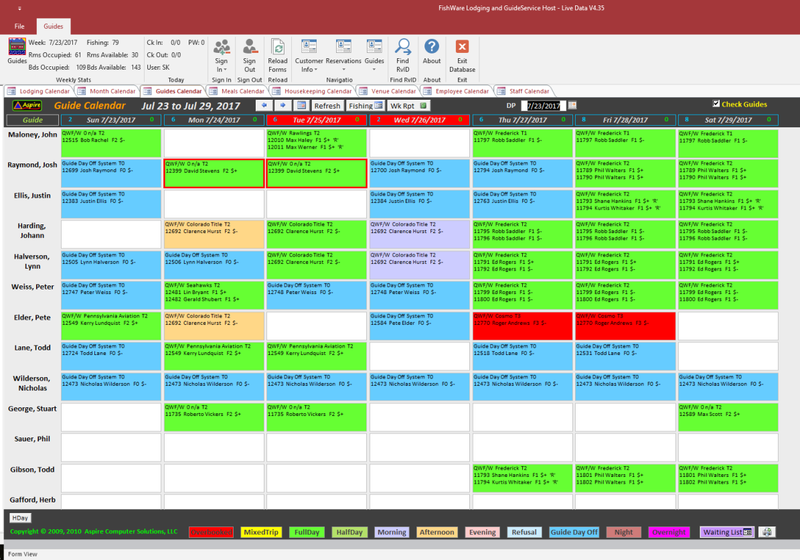 As with the Meals calendar, the heavy red border indicates that a customer has a special meal requirement. The Guide Calendar is customizable and allows you to specify up to 35 guides and determine which row number each Guide occupies. You want to put your most desired Guides at the top. Red in the Guide section (not shown) indicates overbooking, too many in a boat, etc. Customizable Holidays and special events are shown in the form footer.